At 27-years-old, Britain's Mark Cavendish has already guaranteed that he will go down as one of the greatest road race sprinters of all time, but the 2011 world champion has one main priority for the upcoming season, to win Olympic gold in London in front of his home fans. "The Games in London are an opportunity of a lifetime for me," he readily admits ahead of what will be a strong bid for the road race title. The new holder of the rainbow tunic as world champion also won the green jersey in 2011 as points champion in the Tour de France and the fiery Brit has already chalked up a staggering 20 stage wins on the world's greatest bike race. "This jersey (as world champion) motivates me even more and I want to have a big season. The Tour de France is important for me but I would be lying if I said I am not dreaming of winning the Olympic road race". he admitted. His talents were groomed on the Isle of Man where as a young lad, he would ride BMX and mountain bikes across the rugged terrains and roads before working in a bank in order to finance his first professional license. Despite being Madison world champion in 2005 with Robert Hayles and then again in 2008 with Bradley Wiggins, 'Cav' was a virtual unknown to the general public before four stage wins on the 2008 Tour de France propelled him to outright stardom. After making his professional debut with the German team Sparkasse, he signed with T-Mobile in late 2006 and won his first big race one year later by taking the Escaut Grand Prix. The 2008 campaign marked his true arrival at the top of cycling with four stage wins on the TDF, two on the Giro d'Italia and 17 wins for the season in which the only stain was a disappointing eighth place finish in the Olympic Madision race at Beijing with Wiggins. An outright sprinting machine and renowned for a bristling, cocky, almost arrogant approach, Cavendish won the 100th edition of the Milan-San Remo race at 23, scooped up another six TDF stage wins in 2009 and firmly established himself as the fastest man in the world. His "bad boy" image was further enhanced in 2010 when he celebrated his victory in the second stage of the 2010 Tour of Romandie with a defiant two-fingered salute as he crossed the finish line after criticism from other riders and media who questioned his aggressive, disrespectful attitude. "There is no smoke without fire but some people pour oil on the fire," he admitted. In 2011 he took his stage tally on the TDF to 20 victories and won his first green jersey after surviving the mountains and once again winning the final stage on the Champs Elysees. Then in September, he won the world championship road race in Copenhagen, 46 years after the last British rider Tom Simpson, for what was one of his greatest triumphs. 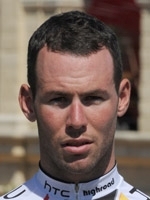 Now after joining his old buddy Bradley Wiggins at the Sky team, Cavendish targets his Olympic dream on the streets of London where he has the chance to complete one of his greatest ambitions.